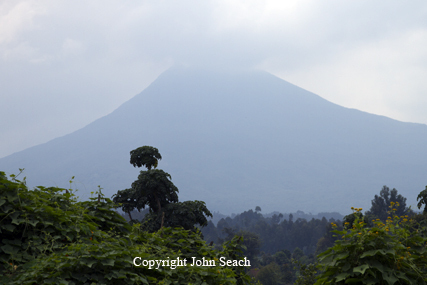 Gahinga (Mgahinga) volcano is located in the eastern Virunga ranges. There is a swamp crater on the summit of Mt Gahinga. The plains at the foot of the volcano are characterised by deep volcanic ash, and run-off from the mountains rapidly disappears underground. Mgahinga Gorilla National Park includes three of the Virunga volcanoes - Mt Muhabura, Mt Gahinga, and Mt Sabyinyo.